What do you typically serve your dinner guests?! I have found that a “bar” of some sorts works best. A potato bar, as seen above, or a make your own pizza bar with homemade crusts and a variety of toppings and cheese, or pasta bar with 2-3 types of cooked noodles and 2-3 different sauces. You could also serve something like what Christan served our family…Stack-E-Up-Es. There’s nothing wrong with sharing the dinner duties (both in preparation time and money-wise) when it comes to enjoying a meal with friends and/or extended family! Your turn. What do you serve up when you have guests over?!? My favorite is to serve something out of the crock pot. That way, it’s all done ahead of time and there’s always plenty to go around (and still usually some for lunch the next day). Plus, it’s comfort food! Spaghetti and meatballs. It’s so easy to make homemade sauce and making meatballs from ground turkey or beef on sale is inexpensive. I like to make a loaf of bread in the bread maching too. Easy and your whole house smells so good! I love making lasagna. Its easy to make to feed a lot of people and I use the foil trays so its easy clean up after a night of entertaining. 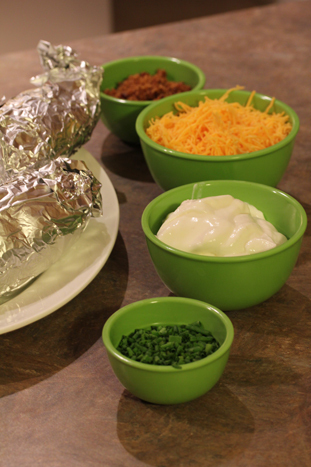 We do a taco & burrito bar. We grill chicken or beef or will even brown ground beef if it isn’t grilling weather. We put out a variety of lettuce, cheese, sour cream, beans, rice, avocados, tomatoes, salsas and several types of tortillas. Everyone can make their own and it is usually a hit. I found this site yesterday and realized just now that I have dinner quests tomorrow. I thought, gee wonder if there are any good inexpensive idea on the $5 site. Looks like I was in luck! Thank you!! If we are having a get together in cold weather months, I make a huge pot of chili with garlic bread and a nice dessert with a great tasting pot of flavored coffee. It is pretty inexpensive but will feed many people. I usually throw on a big pot of spagetti when I don’t have a lot of notice for people coming. If I have more notice, I enjoy making other stuff like enchilladas or mac and cheese because they are casseroles that can quickly go in the oven when we are ready for dinner without making a mess of the kitchen. I recently started a girls lunch once a month so that we can get together and not have the horrible high costs of eating out. We are doing a pot luck where everyone brings a dish to pass and the host provides the meat. I really think that we should do the pizza bar, potato bar, and taco bar for upcoming events. I can’t wait to try these yummy ideas. Mix a can of mushroom soup and a small carton of sour cream. Pour it over some chicken (boneless skinless breasts or fryer pieces and bake covered @350 for about 1-1/2 hours. Serve over rice with a side of tossed salad and ice cream for dessert. To stretch the meat, cut into bite sized pieces and double or triple the sauce. (It won’t need to cook as long.) Very easy and almost everyone likes it. If the kids are extremely picky, you can rinse the sauce off their chicken, but most kids love the sauce. What I would do is if their are relatives coming to see grand children you should make something everyone loves! For example, a good dessert would be strawberry shortcake!! !